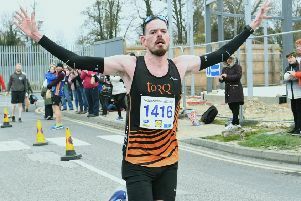 Aaron Scott was back to winning ways in his first outing for several months, as he crossed the line first in Sunday’s Kimbolton Half-Marathon. The newly-married Lincoln Wellington athlete from Stamford won in a modest time of 1:11.02, but his priority was to take the prize for first place rather than racing the clock. It was a good morning for Peterborough-based athletes with Bushfield’s Brian Corley finishing fourth and first veteran with a 1:13.32 clocking. Peterborough AC’s Kirk Brawn finished 12th in 1:18.51 while Jeff Lucas of Werrington Joggers claimed 15th place with a time of 1:21.45. Training partners Michael Moore, currently without a club, and Stamford Strider Jim Morris finished 23rd and 26th respectively with Moore running 1:22.14 and Morris 1:22.58. Yaxley’s Caroline Woods was the first local lady, finishing fifth in 1:33.32.